Spider-Man's greatest foes have a habit of teaming up against him. After his last tangle with the Sinister Six, Peter Parker developed a new suit of armor he could use against them. 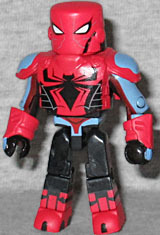 This suit of Spider-Armor showed up in the "Ends of the Earth" storyline, and was designed by Stefano Caselli. He uses the gloves and chest armor from Agent Venom. That's a clever bit of re-use, even if it means that the gloves are the wrong shape, and the chest cap has been turned around backwards to make it look different. The suit keeps the standard Spider-Man colors - red, blue and black - but looks drastically different from the Spidey we know. You can remove both the helmet and the bodyarmor to reveal painted pieces beneath. The head gets the weird little half-mask he wore beneath the helmet, with its exposed mouth and clear goggles. His torso has the jacket he was wearing under the armor, with a zipper up the front, a webbing pattern on the lining, and a big red spider on the back. The illusionist and criminal Quentin Beck has faked his death numerous times, but he has always resurfaced to menace Spider-Man, either on his own or as a member of the Sinister Six. 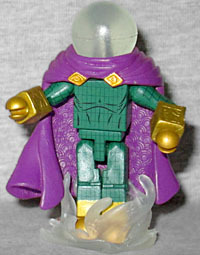 No surprise this Mysterio uses a lot of the same pieces as the previous version. Actually, look at that! We got our first Mysterio in Marvel Minimates Series 19, and we get our next one in TRU Series 19. How's that for symmetry! His cape, gloves and head are reused, finally getting a little bit more value out of those molds for AA, and he has a colorless version of Dr. Strange's swirly base. The painted costume details on this Mysterio aren't as complex (or complete) as the last one, which is a shame, because the colors are nicer here. This set doesn't get one of the silver "TRU exclusive" stickers, but neither of the figures are available in any other sets. So what, exactly, keeps this from being an exclusive?